Our feline friends have a special place in our heart, so, we want the best for them. As our cat food advisor emphasize that feeding your cat with the high quality and nutritional food is very important to his/her health. Although every cat food brands will tell you that their cat food is better and more nutritional, it is always good practice to figure out what the food you’re feeding to your cat. Fortunately, our cat food advisor will show you how to choose the best cat food for your cat. To buy the dry cat food or wet cat food? As we all know, there is a variety of cat food you can choose from. However, which cat food you should buy for your cat? To buy the dry cat food or wet cat food for your cat? As a cat owner, you should know the general classifications of cat food are dry cat food and wet cat food, the wet food also includes raw cat food and canned cat food. 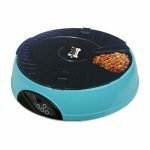 The dry cat food is the most popular one, it is probably the first thing that comes to your mind when you think about cat food at all. Compared to the other types of food, dry cat food is easy to find, and it’s affordable too. However, every type of cat food is designed to certain age cat and has also good and bad sides. Therefore, it’s very important to figure out the quality of what you’re feeding to your felines. On sometimes, wet cat food on the other side seems to be taken as being better for your cat’s health in general. Things you should know when buying cat food! A great meal for your cat should be a meal that is tasty, nutritious, and healthy. For example, some cat food that can keep your cat’s coating, skin, and organism intact. However, the debate about what kind of food you should feed to your cat always exists. Our cat food advisor explains that the answer isn’t in picking just one of the foods, but in planning a balanced diet that includes all nutrition your cat needs. Do it for your cat just like you would do it for yourself. For example, you wouldn’t feel great eating only dry sacks for every meal, would you? Well… about the raw meat not so much. Even though sometimes cats are convinced that you, as their owners are going to love some fresh meat, so you have fresh prey delivered. But, cats are carnivores, they love meat, and the proteins they get from meat are very important for their well-being. Your cat can get proteins from the dry cat food, of course, but not enough hydration, which you can find in the wet food. Then again, your cat won’t get proteins and hydration from the dry cat food as much as getting from the raw cat food meal. So, as the cat food advisor said, the best thing to do is to plan a diet that balances all of these food proportion as much as possible. The variety diet will make your cat’s munching time a lot more enjoyable and a lot more healthy! You can find cat food pretty much anywhere, but the matter is to figure out the quality of the product you’re going to buy for your cat. Always keep an eye on what it is that you’re buying to put on your cat’s plate. 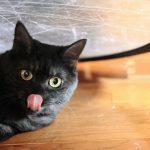 To help you with making a good choice, our cat food advisor made a list of some of the best dry cat food, canned cat food and raw cat food for you to reference. As we mentioned before, there are tons and tons of options when it comes to buying cat food. It applies to the dry cat food too. There are so many options when you to buy dry cat food on the market. 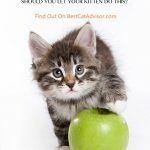 To save your time, you can check out the following a list of some of the high-quality dry cat food, or read the buyer’s guide – Things you should know when choosing the best dry cat food. This is a high-quality cat food product that backed by the Wellness Guarantee and proudly made only in the USA. 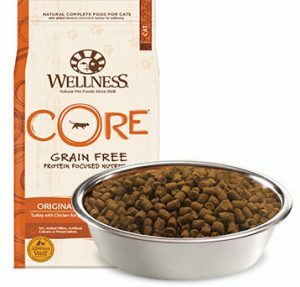 Wellness CORE Natural Grain Free dry cat food is free of artificial flavoring and coloring. Some of the ingredients include chicken, white fish, turkey, vegetables… and vitamins, these ingredients are very important to your cat’s health. Being very high in protein and grain free, which balanced everyday nutrition for your cat. Wellness CORE provides the carnivore feline friend a lot of nutrition. 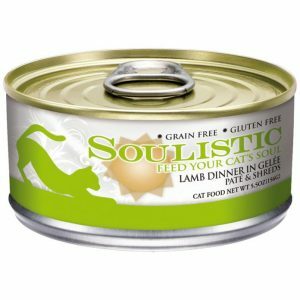 No doubt, this is a dry cat food with great texture that your cat will enjoy it. It’s a type of nutritious cat food. Chicken Meal & Field Pea contain 40% natural chicken proteins, 4% of fibers and 18% of fats. Dried yeast, eggs, chicken and whitefish meal, chickpeas, spinach, carrots, lettuce, parsley, cranberry, and blueberry, as well as vitamins like vitamin E, D3, B12, zinc oxide, zinc proteinate… lecithin and chicken fats. It is grain free and it has no artificial flavor or coloring. The fact that this cat food brand is grain free is great. 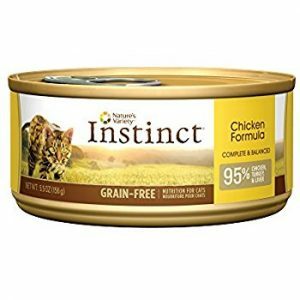 Grain-free cat food contains more the ingredients that your carnivore feline would usually eat in the wild, which makes it healthier and more nutritious. This dry cat food contains a variety of ingredients that are nutritious and healthy for your cat. 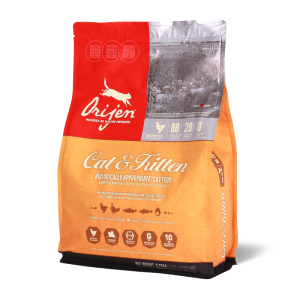 The Orijen Kitten & Cat Dry food has carefully picked and processed ingredients, giving the total ingredients 19% of low-glycemic carbs and 40% high in protein. A third of the meat comes from fried chicken and turkey, and the rest of it is fresh raw meat. Orijen Kitten & Cat Dry Cat Food does not contain any harmful ingredients like plant protein concentrates. It’s a good choice for the adult cat. 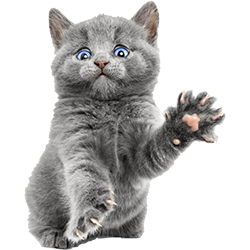 Salmon Bleu dry cat food is well suitable for cats of all ages. If your kitten likes the fish-based cat food, then they’re going to enjoy this food. Salmon Bleu has glucosamine among the rest of the ingredients – an important supplement to keep the joints of your cat healthy. 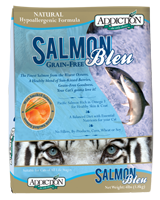 Salmon Bleu dry cat food is grain free, no artificial color and flavor. It helps with keeping the skin and the coat of your kitten healthy (nice, smooth, healthy grain free fur balls it is then, eh?). 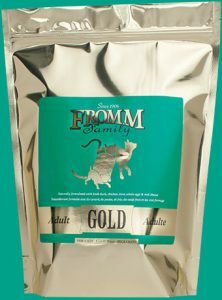 Fromm Gold Holistic adult dry cat food comes in a small package, and it is a quite enjoyable meal for your cat. Chicken (chicken meal, chicken fat, chicken liver), cheese, white rice, salmon meal, potatoes, dried eggs, salmon oil, magnesium sulfate and proteinate, vitamin supplements for vitamin A, B12, and D3… It contains a little bit over 30% proteins, 18% fats and 3.5% fibers. What’s interesting about the cat food is that among its ingredients, Fromm Gold Holistic contains dried cheddar cheese, your cat will love it. For your cat’s health, you should also regularly feed some wet food to your cat to balance the diet. In general, the wet cat food is more nutritious than dry food. The following are some of the wet cat food products that recommended by our cat food advisor. If you are decided to purchase wet food for your cat, don’t hesitate to check out them. 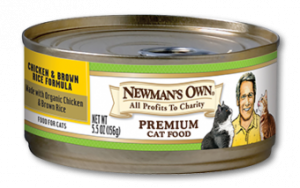 The Newman’s Own Chicken and Brown Rice wet food are both great choices for the kitten, adult, and senior cat. Every ingredient in the Newman’s Own Premium Canned Formulas food is natural and grown without adding any pesticides. Such as the included meat from chickens that are fed natural foods, cat food advisor finds that to be super cool! This wet cat food is almost 100% organic and full of healthy nutrition for your cat. Some of the ingredients include whitefish, organic brown rice, vitamin supplements (vitamin A, vitamin D3, vitamin B12), organic chicken, taurine and oat bran. No doubt, the wet cat food worth your investment for it because the food will bring great benefits to your cat’s health. Don’t hesitate to buy it now! 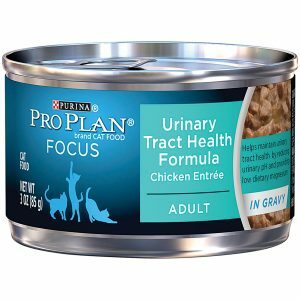 If you have an adult cat and you want to improve their urinary tract health, the Pro Plan Focus Adult Urinary Tract Health Formula Canned Cat Food is the great choice for you. Because it helps with the digestion process and is great for the digestive system. The food is made with real Chicken, and the main ingredients are chicken, wheat gluten, and some vitamin B2, D3, B12 supplements, folic acid, and biotin. And the optimal protein and fat levels can help promote ideal body condition. The Pro Plan wet cat food helps maintain Urinary Tract health by reducing Urinary pH and providing low dietary magnesium. And also helps in maintaining the health of the cat’s skin and coating as well. This cat food made in the USA with the finest ingredients from around the world. It’s gluten-free, grains free and full of meat and healthy omega acids. You can find the main ingredients in this canned food are chicken meat and turkey meat (95%), vegetables, fruits and vitamins (5%). It’s high in protein and super nutritious. It is very close to what your cat would eat being a carnivore in the wilderness. So, it’s time to buy it for your cat. Another wet cat food that cat food advisor recommends is the Duck&Salmon Feast Canned food. 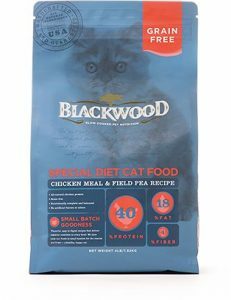 The main ingredients that this canned cat food contains are a duck and duck broth, salmon, poultry and poultry liver, dried fruits and vegetables (apricots, carrots, broccoli, cranberry, parsley, pumpkin, tomatoes). As well as dried egg product and egg shell meal. 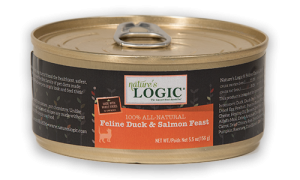 Nature’s logic feline duck and salmon feast Canned food is also 100% organic and grain free. No doubt, this is also a nutritious wet cat food that with high amounts of muscle and organ meat, which can provide all of the vitamins your cat needs. This canned cat food is grain free, and it does not contain any unnatural flavors and artificial ingredients. It also helps with keeping your cat’s system hydrated and healthy, while still being tasty and nutritious enough to please the pure belly. I can sure that your cat will love the wholesome, tasty meats and juices in this canned cat food. What’s more, this natural wet cat food is specially formulated to promote the nutritious balance, health, and wellness of your cat. In general, raw cat food is the closest to what a cat would actually eat in the wilderness. The diet of raw food that not cooked isn’t the food humans are used to eat. But, cats are carnivores and to them the raw food is delicious. However, even though cats are carnivores, cat food advisor would suggest you need to be really careful when you are going to feed raw cat food to your cat. May you argue that you can always purchase raw meat by yourself, then it shouldn’t be that hard, right? Yeah! but please add some ingredients to it. In fact, raw cat food doesn’t mean meat only, and that doesn’t mean that a raw meal should only have meat and nothing else. Although raw cat food is very nutritious, you can always buy the meat by yourself and make a meal for your cat to enjoy. You can add vegetables, eggs, bone, and water to the meat that will keep your cat hydrated. 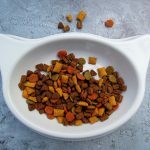 Just like in the foods you buy from the store, you can add bones, livers, vitamin supplements, and blend it all in into a delicious and nutritious treat for your cat. As you read here, you must have noticed things from the list of cat food above are that there are a few things you should pay attention when it comes to choosing cat food. Make sure that the food you purchase for your feline friend is grain free (or contains as little grain as possible), is a healthy and organic mix of meat, vegetables, and vitamins. Figure out whether it contains great chicken, fish and turkey meat. When it comes to vegetables and fruits, dried spinach, tomatoes, cranberries or blueberries are very common and great for your cat’s diet. The vitamins that your cat needs the most are A, B vitamins (B6, B12), D3 vitamin, C vitamin. Make sure that when you purchase the cat food you got all of these in the box. Even if you don’t go to buy raw cat food, that’s fine. 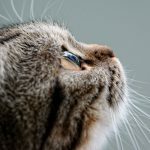 What’s more important is that your cat’s diet is balanced, so that they can get all the vitamins, proteins and calories that they need so that they can be healthy. Your goal should be to balance everything as much as possible and keep your cat healthy and happy. Which food does my cat prefer? Most cats do prefer canned diets because the wet cat food is closer to what they would want to chew on as a carnivore. But if you can’t afford that canned cat food, it’s also fine. They will be just fine eating a few dry crackers as long as you keep everything as balanced as you possibly can. Another thing that most cats prefer is the taste of fish meat. But don’t feed too much fish meat to your cat even the food your cats favorite. It isn’t just the variety of food but the variety of the ingredients that are important. Naturally, cats aren’t very much into drinking water, you can add a little water to the dry cat food if you want to make sure that your cat gets enough water. Or replace the dry cat food with wet cat food. Feed your kitten with canned cat food can decrease the drinking of water because the canned food contains water already. When your cat is on a diet, dry cat food is great for balancing portions. If you have an extremely carnivore cat (which sometimes can be the case, and you can confirm it if you found some dead animals your doorstep) then a raw meat would be a delicious food to your cat. When it comes to food, your cat has its own specific needs and preferences. To know more about your cat’s diet habits is a great benefit to cat’s health. Experiment a little bit and see what gives the best results when it comes to your cat. It isn’t the same for every cat in the world. Treat your feline just like you would treat yourself when it comes to nutrition. Just like with humans, the diet of cats is a great dictator of their health, well being and a long life. Contact your cat food advisor or cat food expert to help you plan the diet if you can’t do it yourself. A variety of texture, flavor, vitamins, and types of cat food is the best way to go. You know your cat better than anyone else. Every cat is different, every cat has different health, personality and a different taste in foods. So, try your best to feed your cat with healthy food that your cat enjoys.